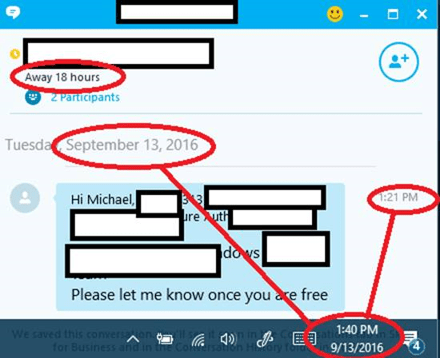 One of the great things about Skype for Business is you can see if a remote person is available for a chat or if they are busy in a meeting. Taking advantage of the presence capabilities is a very useful tool. However, some people try to game the system and artificially set their presence. They may set their presence to “Away” when they are actually available just because they don’t want to be bothered by anyone. Yet those same people are more than happy to send you an IM while they are “Away”. You’ve been Away 18 hours yet still sent me an IM? I’m no fan of being a Presence Liar, but there are some decent reasons to do it. Some people schedule “meetings” so that they can have time to get actual work done. But what if you work remotely and, you know, screw around a bunch. You don’t want your boss to look at your status all the time and see “Away” because you aren’t using your PC much while napping. How can you game the system? By default, your status changes from Available to Away after 5 minutes of not using your mouse or PC. Having to touch your PC once every 5 minutes is totally preventing me from napping during the workday. One solution is to download a little bit of software to take this pain away from you. Caffeine is one option (I haven’t tried it). Apparently this utility simulates pressing the F15 (not a typo) key every 59 seconds. This one fakes mouse movements every so often. So that’s an easy and free fix. But what if you work in an environment where you can’t install any software on your computer? Or what if your company scans your PC for software like this and you end up on a report and a call form your boss? Is there a stealthier way to stay “available” while napping? Welcome to the world of Mouse Jiggler. This little bad boy is the answer to all your napping-during-work-while-still-being-“available” dreams. As far as Windows is concerned, you just plugged in a generic HID-compliant mouse. As far as you are concerned, you are now moving the mouse every so often – just enough to keep the screen awake and your status as Available. So how does Windows see this? Generic Mouseville, Population one. I actually have 2 real mice connected plus the Mouse Jiggler. Not sure what that fourth one is! 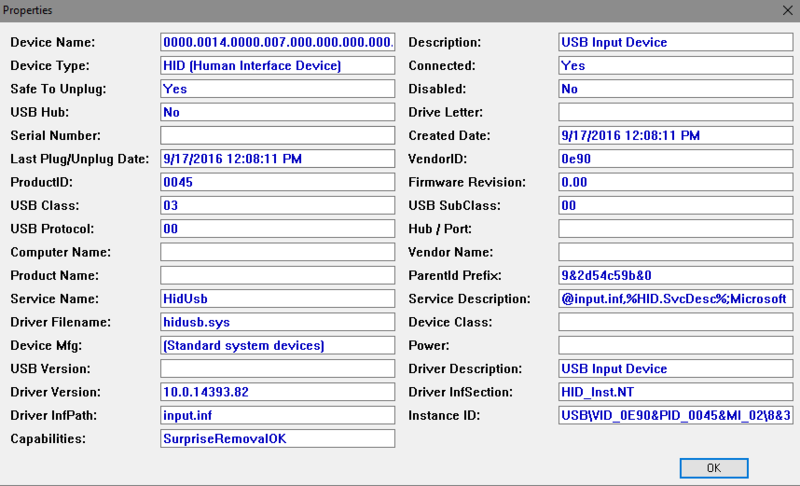 I also downloaded some random USB reporting tool and I found the Mouse Jiggler in my list of USB devices. So how much and how often does the mouse get moved? I used a mouse recording utility, set it to start, then left the room to watch some football. I came back and saw the below output. The very first entry is me clicking “record” with my mouse so we can ignore that entry. Thereafter, everything is being input by the Mouse Jiggler. The second column is the X-Axis, the third column the Y-Axis, and the 4th column is elapsed milliseconds since last movement. The first action happened after almost 6 minutes. The Jiggler moved the mouse 1 pixel. Three minutes later, the mouse was moved 7 pixels. And then after about the same delay, the mouse was moved 8 pixels. This is enough movement to keep my Skype for Business client listed as Available. It also keeps the screensaver off. This is useful if you work somewhere that sets the screensaver lockout duration to 1 minute. Presenters use Mouse Jiggler because it allows them to present without the screensaver popping up in the middle of the presentation. 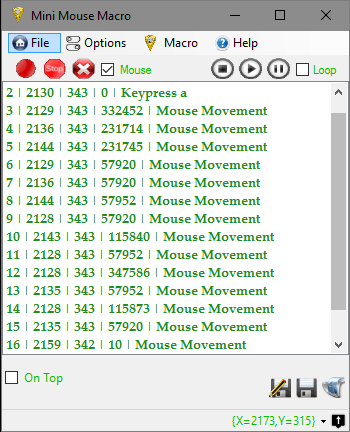 Employees who are unable to change their system sleep settings or install unapproved software on their computers find Mouse Jiggler convenient to keep screen savers or login screens from activating. 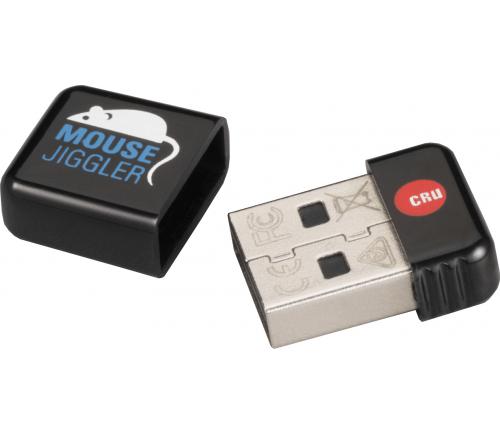 IT professionals use the Mouse Jiggler to prevent password dialog boxes due to screensavers or sleep mode after an employee is terminated and they need to maintain access to their computer. Computer forensic investigators use Mouse Jigglers to prevent password dialog boxes from appearing due to screensavers or sleep mode. With many computer hard drives now employing full-disk encryption, such modes can greatly increase the time and cost of a forensic investigation. I don’t care about those. I just like to know that I’m always Available, even while napping. And if my boss is reading this, I am only writing this as an overview of a device related to my expertise, not because I’m nappinzzzzzzzzzzzzzzzzzzzzzz….. Sorry, but that is a madeup BS. Win + X –> Turn presentation mode ON, and voila: screensaver no longer activates! Its there since 10 yrs (Vista introduced this feature first). Agree / disagree / I missed the whole point / etc. ? Abandoned? I won’t stand for this! And one of these days I may actually write something new. So less abandoned as nothing to write about. Sorry, but that is a madeup BS. Win + X –> Turn presentation mode ON and voila: screensaver no longer activates! Its there since 10 yrs (Vista introduced this feature first). What is this guy’s problem? What if you’re not using winderz Outlook professional 5000 and don’t have that option? Soder is such a flipping bundle of sticks.